Yangon (Burmese: ရန်ကုန်, MLCTS rankun mrui, [jàɴɡòʊɴ mjo̰]; formerly known as Rangoon, literally: "End of Strife") is the capital of the Yangon Region of Myanmar, also known as Burma. Yangon served as the capital of Myanmar until 2006, when the military government relocated the capital to the purpose-built city of Naypyidaw in central Myanmar. With over 7 million people, Yangon is Myanmar's largest city and its most important commercial centre. Yangon boasts the largest number of colonial-era buildings in Southeast Asia, and has a unique colonial-era urban core that is remarkably intact. The colonial-era commercial core is centred around the Sule Pagoda, which is reputed to be over 2,000 years old. The city is also home to the gilded Shwedagon Pagoda — Myanmar's most sacred Buddhist pagoda. The mausoleum of the last Mughal Emperor is located in Yangon, where he had been exiled following the Indian Mutiny of 1857. Yangon suffers from deeply inadequate infrastructure, especially compared to other major cities in Southeast Asia. Though many historic residential and commercial buildings have been renovated throughout central Yangon, most satellite towns that ring the city continue to be profoundly impoverished and lack basic infrastructure. The name "Yangon" (ရန်ကုန်) is derived from the combination of the Burmese words yan (ရန်) and koun (ကုန်), which mean "enemies" and "run out of", respectively. This word combination is commonly translated as "End of Strife". The city's colonial era name, "Rangoon", likely is derived from the Anglicization of the Arakanese pronunciation of "Yangon", which is [rɔ̀ɴɡʊ́ɴ]. Yangon was founded as Dagon in the early 11th century (c. 1028–1043) by the Mon, who dominated Lower Burma at that time. Dagon was a small fishing village centred about the Shwedagon Pagoda. In 1755, King Alaungpaya conquered Dagon, renamed it "Yangon", and added settlements around Dagon. The British captured Yangon during the First Anglo-Burmese War (1824–26), but returned it to Burmese administration after the war. The city was destroyed by a fire in 1841. The British seized Yangon and all of Lower Burma in the Second Anglo-Burmese War of 1852, and subsequently transformed Yangon into the commercial and political hub of British Burma. In 1853, the British moved the capital of Burma from Moulmein (present-day Mawlamyine) to Yangon. Yangon is also the place where the British sent Bahadur Shah II, the last Mughal emperor, to live after the Indian Rebellion of 1857. Based on the design by army engineer Lt. Alexander Fraser, the British constructed a new city on a grid plan on delta land, bounded to the east by the Pazundaung Creek and to the south and west by the Yangon River. Yangon became the capital of all British-ruled Burma after the British had captured Upper Burma in the Third Anglo-Burmese War of 1885. By the 1890s Yangon's increasing population and commerce gave birth to prosperous residential suburbs to the north of Royal Lake (Kandawgyi) and Inya Lake. 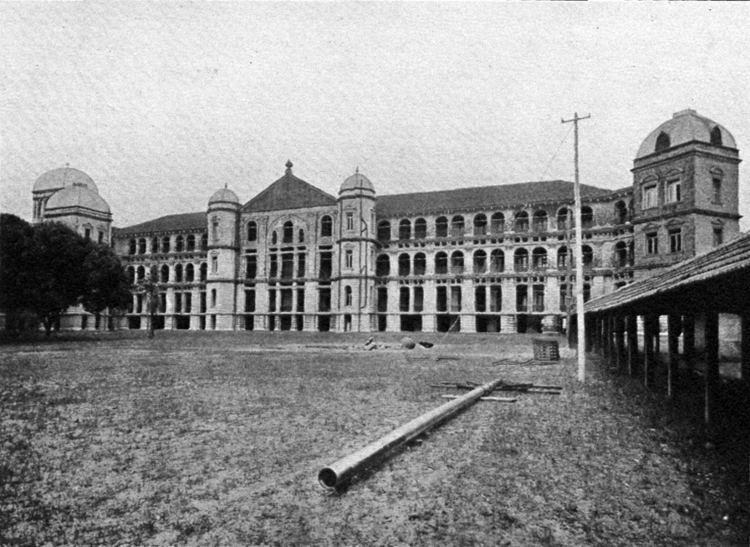 The British also established hospitals including Rangoon General Hospital and colleges including Rangoon University. Yangon has a tropical monsoon climate under the Köppen climate classification system. The city features a lengthy wet season from May through October where a substantial amount of rainfall is received; and a dry season from November through April, where little rainfall is seen. It is primarily due to the heavy rainfall received during the rainy season that Yangon falls under the tropical monsoon climate category. During the course of the year 1961 to 1990s, average temperatures show little variance, with average highs ranging from 29 to 36 °C (84 to 97 °F) and average lows ranging from 18 to 25 °C (64 to 77 °F). Downtown Yangon is known for its leafy avenues and fin-de-siècle architecture. The former British colonial capital has the highest number of colonial period buildings in south-east Asia. Downtown Yangon is still mainly made up of decaying colonial buildings. The former High Court, the former Secretariat buildings, the former St. Paul's English High School and the Strand Hotel are excellent examples of the bygone era. Most downtown buildings from this era are four-story mix-use (residential and commercial) buildings with 14-foot (4.3 m) ceilings, allowing for the construction of mezzanines. Despite their less-than-perfect conditions, the buildings remain highly sought after and most expensive in the city's property market. A latter day hallmark of Yangon is the eight-story apartment building. (In Yangon parlance, a building with no elevators (lifts) is called an apartment building and one with elevators is called a condominium. Condos which have to invest in a local power generator to ensure 24-hour electricity for the elevators are beyond the reach of most Yangonites.) Found throughout the city in various forms, eight-story apartment buildings provide relatively inexpensive housing for many Yangonites. The apartments are usually eight stories high (including the ground floor) mainly because city regulations, until February 2008, required that all buildings higher than 75 feet (23 m) or eight stories to install lifts. The current code calls for elevators in buildings higher than 62 feet (19 m) or six stories, likely ushering in the era of the six-story apartment building. Although most apartment buildings were built only within the last 20 years, they look much older and rundown due to shoddy construction and lack of proper maintenance. Unlike other major Asian cities, Yangon does not have any skyscrapers. Aside from a few high-rise hotels and office towers, most high-rise buildings (usually 10 stories and up) are "condos" scattered across prosperous neighbourhoods north of downtown such as Bahan, Dagon, Kamayut and Mayangon. The tallest building in Yangon, Pyay Gardens, is a 25-story condo in the city's north. The east-west grid of central was laid out by British military engineers Fraser and Montgomerie after the Second Anglo-Burmese War. The city was later developed by the Public Works Department and Bengal Corps of Engineers. The pattern of south to north roads is as follows: one broad 100-foot (30 m) wide broad road, two narrow streets, one mid-size street, two more narrow streets, and then another 100-foot (30 m) wide broad road. This order is repeated from west to east. The narrow streets are numbered; the medium and broad roads are named. The largest and best maintained parks in Yangon are located around Shwedagon Pagoda. To the south-east of the gilded stupa is the most popular recreational area in the city – Kandawgyi Lake. The 150-acre (61-ha) lake is surrounded by the 110-acre (45-ha) Kandawgyi Nature Park, and the 69.25-acre (28-ha) Yangon Zoological Gardens, which consists of a zoo, an aquarium and an amusement park. West of the pagoda towards the former Hluttaw (Parliament) complex is the 130-acre (53-ha) People's Square and Park, (the former parading ground on important national days when Yangon was the capital.) A few miles north of the pagoda lies the 37-acre (15-ha) Inya Lake Park – a favorite hangout place of Yangon University students, and a well-known place of romance in Burmese popular culture. Yangon is administered by the Yangon City Development Committee (YCDC). YCDC also coordinates urban planning. The city is divided into four districts. The districts combined have a total of 33 townships. The current mayor of Yangon is Maung Maung Soe. Each township is administered by a committee of township leaders, who make decisions regarding city beautification and infrastructure. Myo-thit (lit. "New Towns", or satellite towns) are not within such jurisdictions. Yangon International Airport, located 12 miles (19 km) from the centre, is the country's main gateway for domestic and international air travel. The airport has three terminals, known as T1, T2 and T3 which is also known as Domestic. It has direct flights to regional cities in Asia – mainly, Doha, Dubai, Dhaka, Kolkata, Hanoi, Ho Chi Minh City, Hong Kong, Tokyo, Beijing, Seoul, Guangzhou, Taipei, Bangkok, Kuala Lumpur, Kunming and Singapore. Although domestic airlines offer service to about twenty domestic locations, most flights are to tourist destinations such as Bagan, Mandalay, Heho and Ngapali, and to the capital Naypyidaw. Yangon Circular Railway operates a 45.9-kilometre (28.5 mi) 39-station commuter rail network that connects Yangon's satellite towns. The system is heavily utilized by the local populace, selling about 150,000 tickets daily. The popularity of the commuter line has jumped since the government reduced petrol subsidies in August 2007. Yangon has a 4,456-kilometre (2,769 mi) road network of all types (tar, concrete and dirt) in March 2011. Many of the roads are in poor condition and not wide enough to accommodate an increasing number of cars. The vast majority of Yangon residents cannot afford a car and rely on an extensive network of buses to get around. Over 300 public and private bus lines operate about 6,300 crowded buses around the city, carrying over 4.4 million passengers a day. All buses and 80% of the taxis in Yangon run on compressed natural gas (CNG), following the 2005 government decree to save money on imported petroleum. Highway buses to other cities depart from Dagon Ayeyar Highway Bus Terminal for Irrawaddy delta region and Aung Mingala Highway Bus Terminal for other parts of the country. Within Yangon city limits, it is illegal to drive trishaws, bicycles, and motorcycles. Since February 2010, pickup truck bus lines have been forbidden to run in 6 townships of central Yangon, namely Latha, Lanmadaw, Pabedan, Kyauktada, Botahtaung and Pazundaung Townships. In May 2003, a ban on using car horns was implemented in six townships of Downtown Yangon to reduce noise pollution. In April 2004, the car horn ban was expanded to cover the entire city. Yangon's four main passenger jetties, all located on or near downtown waterfront, mainly serve local ferries across the river to Dala and Thanlyin, and regional ferries to the Irrawaddy delta. The 22-mile (35 km) Twante Canal was the quickest route from Yangon to the Irrawaddy delta until the 1990s when roads between Yangon and the Irrawaddy Division became usable year-round. While passenger ferries to the delta are still used, those to Upper Burma via the Irrawaddy river are now limited mostly to tourist river cruises. Yangon is the most populous city by far in Burma although estimates of the size of its population vary widely. All population figures are estimates since no official census has been conducted in Burma since 1983. A UN estimate puts the population as 4.35 million in 2010 but a 2009 U.S. State Department estimate puts it at 5.5 million. The U.S. State Department's estimate is probably closer to the real number since the UN number is a straight-line projection, and does not appear to take the expansion of city limits in the past two decades into account. The city's population grew sharply after 1948 as many people (mainly, the indigenous Burmese) from other parts of the country moved into the newly built satellite towns of North Okkalapa, South Okkalapa, and Thaketa in the 1950s and East Dagon, North Dagon and South Dagon in the 1990s. Immigrants have founded their regional associations (such as Mandalay Association, Mawlamyaing Association, etc.) in Yangon for networking purposes. The government's decision to move the nation's administrative capital to Naypyidaw has drained an unknown number of civil servants away from Yangon. Yangon is the most ethnically diverse city in the country. While Indians formed the slight majority prior to World War II, today, the majority of the population is of indigenous Bamar (Burman) descent. Large communities of Indians/South Asian Burmese and the Chinese Burmese exist especially in the traditional downtown neighborhoods. A large number of Rakhine and Karen also live in the city. Burmese is the principal language of the city. English is by far the preferred second language of the educated class. In recent years, however, the prospect of overseas job opportunities has enticed some to study other languages: Mandarin Chinese is most popular, followed by Japanese, and French. The primary religions practiced in Yangon are Buddhism, Christianity, Hinduism, and Islam. Shwedagon Pagoda is a famous religious landmark in the city. Access to foreign media is extremely difficult. Satellite television in Yangon, and in Burma, is very expensive as the government imposes an annual registration fee of one million kyats. Certain foreign newspapers and periodicals such as the International Herald Tribune and the Straits Times can be found only in a few (mostly downtown) bookstores. Internet access in Yangon, which has the best telecommunication infrastructure in the country, is slow and erratic at best, and the Burmese government implements one of the world's most restrictive regimes of Internet control. International text messaging and voice messaging was permitted only in August 2008. Common facilities taken for granted elsewhere are luxury prized items in Yangon and Burma. The price of a GSM mobile phone was about K1.1 million in August 2008. In 2007, the country of 55 million had only 775,000 phone lines (including 275,000 mobile phones), and 400,000 computers. Even in Yangon, which has the best infrastructure, the estimated telephone penetration rate was only 6% at the end of 2004, and the official waiting time for a telephone line was 3.6 years. Most people cannot afford a computer and have to use the city's numerous Internet cafes to access a heavily restricted Internet, and a heavily censored local intranet. According to official statistics, in July 2010, the country had over 400,000 Internet users, with the vast majority hailing from just two cities, Yangon and Mandalay. Although Internet access was available in 42 cities across the country, the number of users outside the two main cities was just over 10,000. Most men of all ages (and some women) spend their time at ubiquitous tea-shops, found in any corner or street of the city. Watching European football (mostly English Premier League with occasional La Liga, Serie A, Bundesliga) matches while sipping tea is a popular pastime among many Yangonites. The average person stays close to his or her residential neighbourhood. The well-to-do tend to visit shopping malls and parks on weekends. Some leave the city on weekends for Chaungtha and Ngwesaung beach resorts in Ayeyarwady Division. Due to the problems of high inflation, the lack of high denomination notes, and the fact that many of the population do not have access to checks, or credit or debit cards, it is common to see citizens carrying a considerable amount of cash. (The highest denomination of Burmese currency kyat is 10 000 (~US$10.)) Credit cards are only rarely used in the city, chiefly in the more lavish hotels. Credit cards are also accepted in the major supermarket and convenience store chains. As the city has the best sporting facilities in the country, most national-level annual sporting tournaments such as track and field, football, volleyball, tennis and swimming are held in Yangon. The 40,000-seat Aung San Stadium and the 32,000-seat Thuwunna Stadium are the main venues for the highly popular annual State and Division football tournament. Until April 2009, the now defunct Myanmar Premier League, consisted of 16 Yangon-based clubs, played all its matches in Yangon stadiums, and attracted little interest from the general public or commercial success despite the enormous popularity of football in Burma. Most Yangonites prefer watching European football on satellite TV. Teams such as Manchester United, Liverpool, Chelsea, Real Madrid, Barcelona, Bayern Munich and Manchester City are among the favorite European teams among the Yangonites. It remains to be seen whether the Myanmar National League, the country's first professional football league, and its Yangon-based club Yangon United FC will attract a sufficient following in the country's most important media market. Yangon has a growing population of skateboarders, as documented in the films Altered Focus: Burma and Youth of Yangon. German non-profit organization Make Life Skate Life has received permission from the Yangon City Development Committee to construct a concrete skatepark at Thakin Mya park in downtown, and plans to complete the park in November 2015. Yangon is the country's main centre for trade, industry, real estate, media, entertainment and tourism. The city represents about one fifth of the national economy. According to official statistics for FY 2010–2011, the size of the economy of Yangon Region was 8.93 trillion kyats, or 23% of the national GDP. 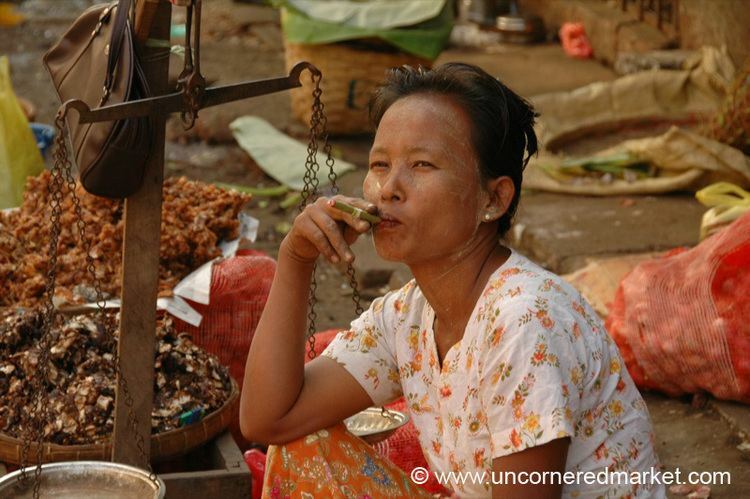 The city is Lower Burma's main trading hub for all kinds of merchandise – from basic food stuffs to used cars although commerce continues to be hampered by the city's severely underdeveloped banking industry and communication infrastructure. Bayinnaung Market is the largest wholesale centre in the country for rice, beans and pulses, and other agricultural commodities. Much of the country's legal imports and exports go through Thilawa Port, the largest and busiest port in Burma. There is also a great deal of informal trade, especially in street markets that exist alongside street platforms of Downtown Yangon's townships. However, on 17 June 2011, the YCDC announced that street vendors, who had previously been allowed to legally open shop at 3 pm, would be prohibited from selling on the streets, and permitted to sell only in their townships of residence, presumably to clean up the city's image. Since 1 December 2009, high-density polyethylene plastic bags have been banned by city authorities. Tourism represents a major source of foreign currency for the city although by south-east Asian standards the number of foreign visitors to Yangon has always been quite low—about 250,000 before the Saffron Revolution in September 2007. The number of visitors dipped even further following the Saffron Revolution and Cyclone Nargis. The recent improvement in the country's political climate has attracted an increasing number of businessmen and tourists. Between 300,000 and 400,000 visitors that went through Yangon International in 2011. However, after years of underinvestment, Yangon's modest hotel infrastructure—only 3000 of the total 8000 hotel rooms in Yangon are "suitable for tourists"—is already bursting at seams, and will need to be expanded to handle additional visitors. As part of an urban development strategy, a hotel zone has been planned in Yangon's outskirts, encompassing government- and military-owned land in Mingaladon, Hlegu and Htaukkyant Townships. Yangon educational facilities has a very high number of qualified teachers but the state spending on education is among the lowest of the world. Around 2007 estimate by the London-based International Institute for Strategic Studies puts the spending for education at 0.5% of the national budget. The disparity in educational opportunities and achievement between rich and poor schools is quite stark even within the city. With little or no state support forthcoming, schools have to rely on forced "donations" and various fees from parents for nearly everything – school maintenance to teachers' salaries, forcing many poor students to drop out. While many students in poor districts fail to reach high school, a handful of Yangon high schools in wealthier districts such as Dagon 1, Sanchaung 2, Kamayut 2, Bahan 2, Latha 2, and TTC provide the majority of students admitted to the most selective universities in the country, highlighting the extreme shallowness of talent pool in the country. The wealthy bypass the state education system altogether, sending their children to private English language instruction schools such as YIEC or more widely known as ISM, or abroad (typically Singapore or Australia) for university education. In 2014, international schools in Yangon cost at least US$8,000 a year. There are over 20 universities and colleges in the city. While Yangon University remains the best known (its main campus is a part of popular Burmese culture e.g. literature, music, film, etc. ), the nation's oldest university is now mostly a graduate school, deprived of undergraduate studies. Following the 1988 nationwide uprising, the military government has repeatedly closed universities, and has dispersed most of undergraduate student population to new universities in the suburbs such as Dagon University, the University of East Yangon and the University of West Yangon. Nonetheless many of the country's most selective universities are still in Yangon. Students from around the country still have to come to study in Yangon as some subjects are offered only at its universities. The University of Medicine 1, University of Medicine 2, Yangon Technological University, University of Computer Studies and Myanmar Maritime University are the most selective in the country. Wealthier Yangonites still have access to country's best medical facilities and internationally qualified doctors. Only Yangon and Mandalay have any sizable number of doctors left as many Burmese doctors have emigrated. The well-to-do go to private clinics or hospitals like Pun Hlaing International Hospital and Bahosi Medical Clinic. Medical malpractice is widespread, even in private clinics and hospitals that serve the well-to-do. In 2009 and 2010, a spate of high-profile deaths brought out the severity of the problem, even for the relatively well off Yangonites. The wealthy do not rely on domestic hospitals and travel abroad, usually Bangkok or Singapore, for treatment. The following are healthcare facilities in Yangon in 2010–2011.